ClarkVision Photograph - Huh? What Did I Do? What Did I Do? Huh? What Did I Do? What Did I Do? 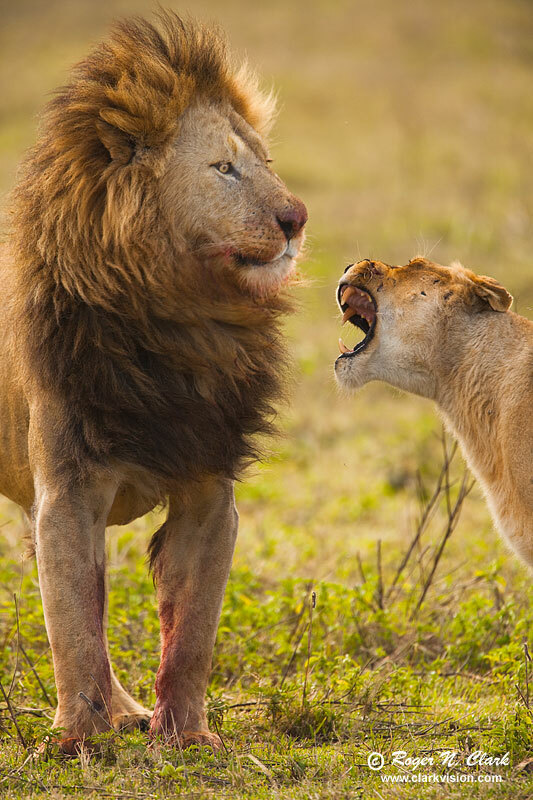 A male lion is startled by the angry lioness. The male had spent a long time gorging on a meal the the lioness had killed. The male lion, as typical, claimed the kill and filled himself up, allowing none of the other lions to approach (for approximately an hour). Once he was full, we was walking away when the lioness, on her way to the leftovers, gave him a piece of her mind. He was quite startled but then walked on and settled down for a nap. Note the the size difference with the male being at least twice the size of the female. Ngorongoro Crater, Tanzania, Africa. Technical: Canon 5D Mark II 21-megapixel camera, Canon 500 mm f/4 L IS lens plus a 1.4x teleconverter giving 700 mm at f/5.6. Exposure: 1/640 second at ISO 400, f/5.6. Full image, no crop.